When my day has been super busy and there is no time to prepare dinner, one of my favorite items to pick up from the store is a rotisserie chicken. Obviously, whoever thought of placing those delicious smelling birds right up front next to the checkout lanes is a genius. My stomach will instantly start growling and suddenly I feel a strong urge to buy one. To help save money on my rotisserie chicken addiction, I found an easy crockpot recipe that you can make at home in your slow cooker. 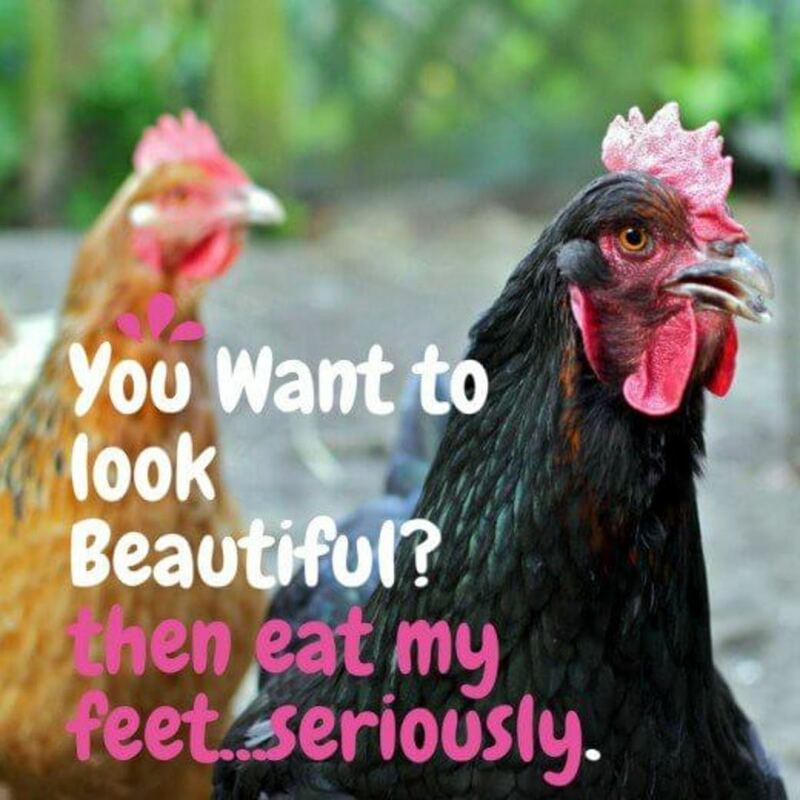 So next time you are at the store, just say no to that tempting batch of chickens! Instead, buy the following ingredients to make this delicious homemade rotisserie chicken that your whole family will love! 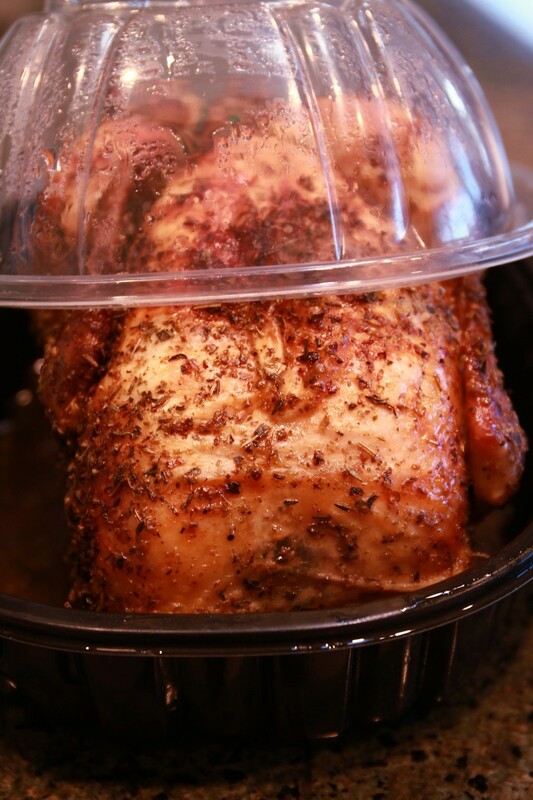 If frozen, properly thaw out whole chicken in refrigerator or microwave. Once thawed, rinse bird under cold water and pat dry with paper towels. Remove bag of giblets located inside cavity of chicken. 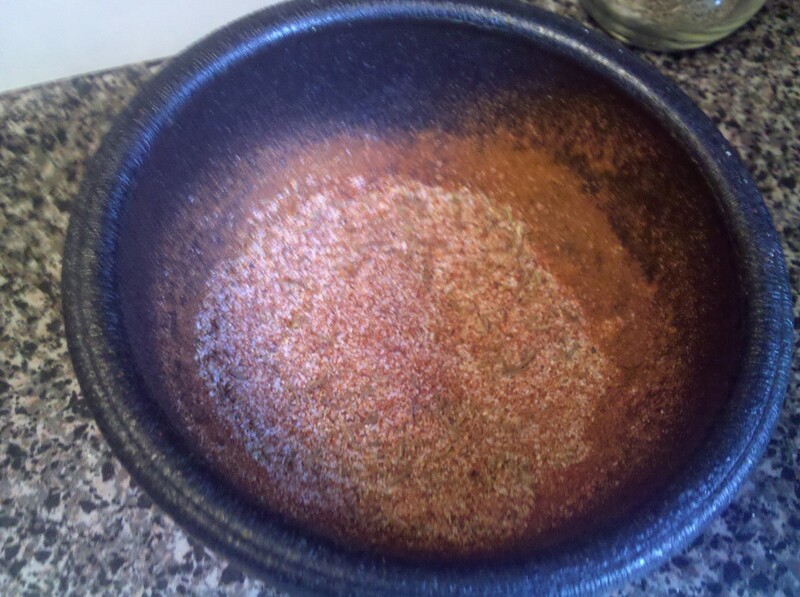 To prepare spice mixture, mix together salt, paprika, onion powder, thyme, garlic powder, red pepper, and black pepper in small bowl. 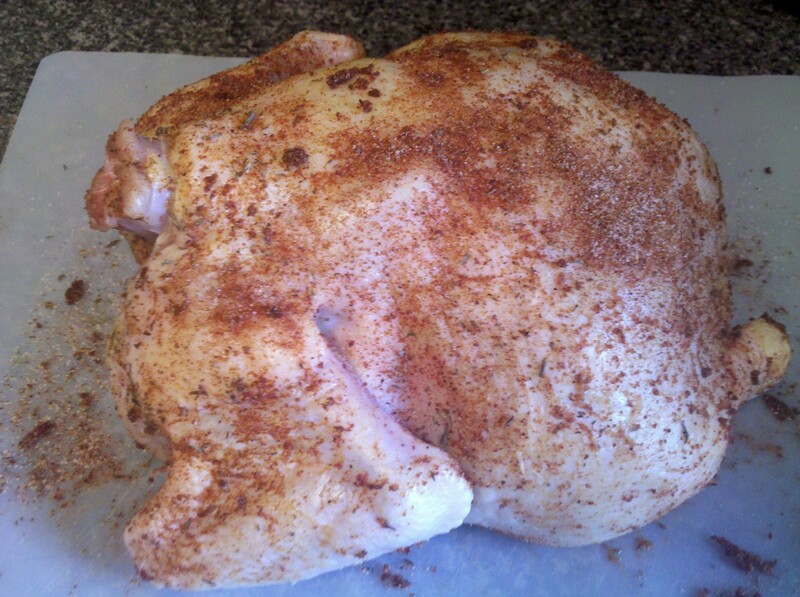 Once the chicken is completely dry, rub spice mixture on the inside and outside of bird. 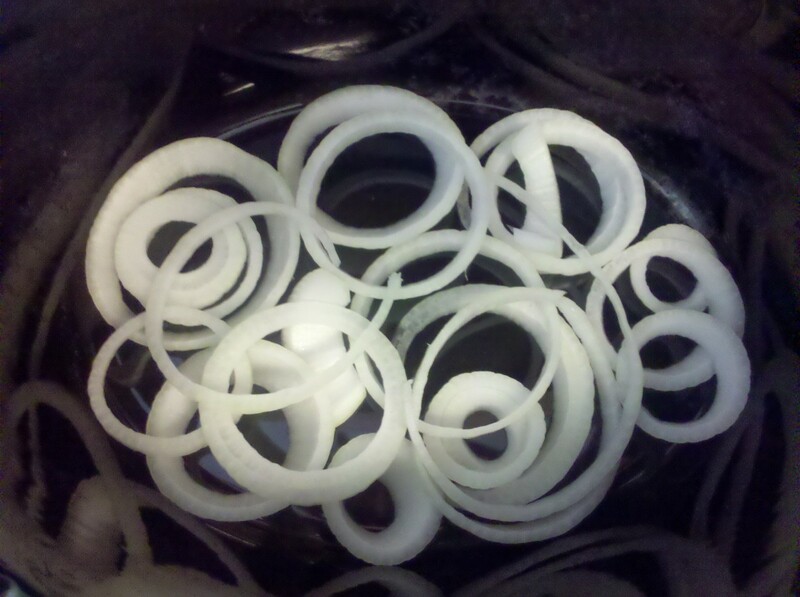 Slice half of a medium sized onion into rings and place on bottom of crockpot. For a little more flavor, I added a couple of rings inside the chicken. Place chicken breast side up on top of onion rings in crockpot. There is no need to add water. The slow cooking of the chicken brings out plenty of juices to properly cook this recipe. Turn crockpot setting to high and let cook for 4 to 5 hours. My crockpot is a newer model and was ready after 4 hours and 15 minutes. If you prefer to cook on the low setting, double the above cooking time. The internal temperature of the chicken should be at least 160 degrees when done. 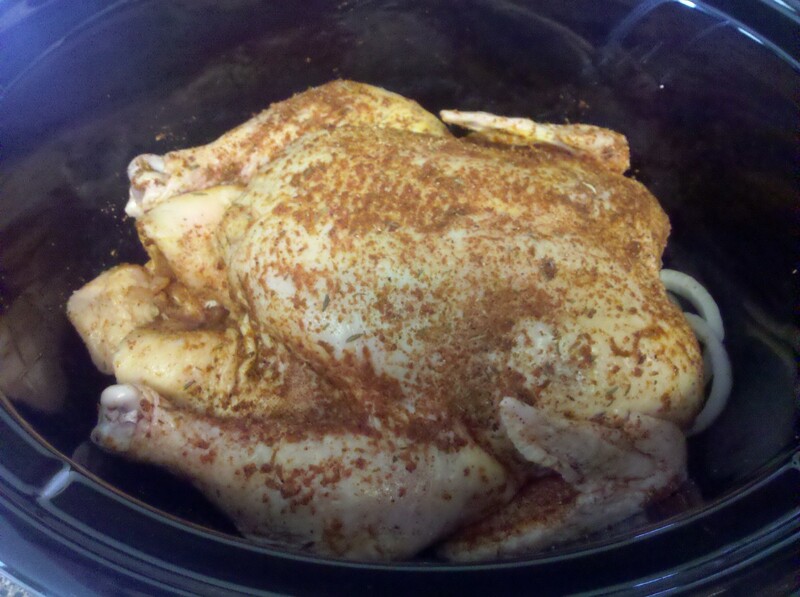 Once the cooking time is complete, carefully remove chicken out of crockpot. This chicken is fall off the bone delicious so don't be surprised if your bird doesn't make it to the plate as picture perfect as you had planned. 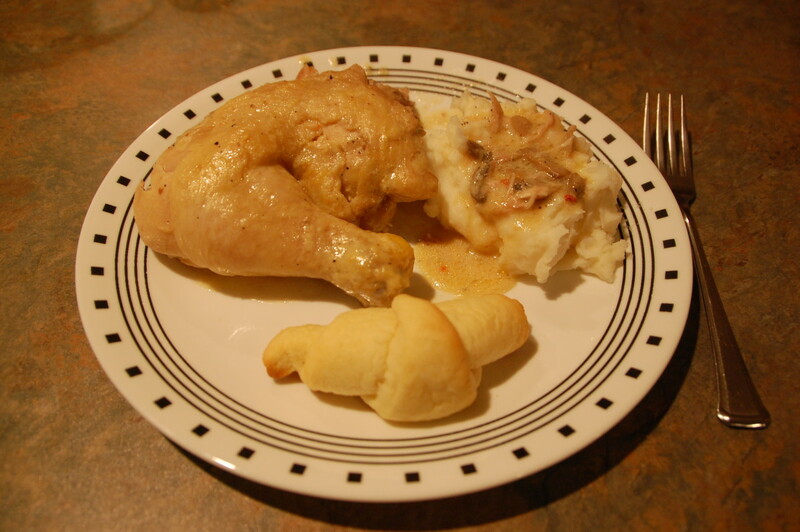 This rotisserie chicken is so easy and one of our family's favorite whole chicken crockpot recipes. I usually make southern style baked beans and creamy mashed potatoes to serve as side dishes to compliment this delicious chicken. If there are any leftovers, save the chicken to add to your favorite soups, casserole dishes, or any other favorite recipes. 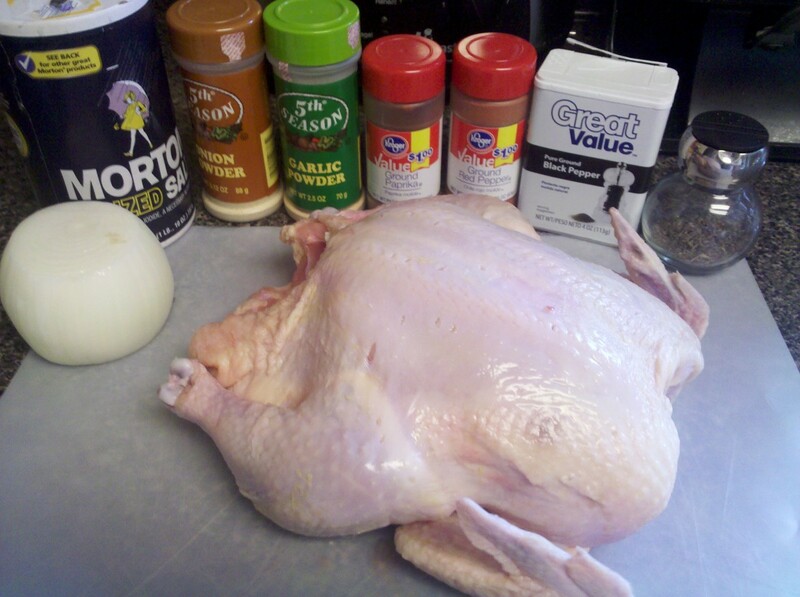 Also be sure to save the leftover bones, skin, and cooking juices to create a large batch of homemade chicken stock. You definitely get your money's worth when you make this great recipe! 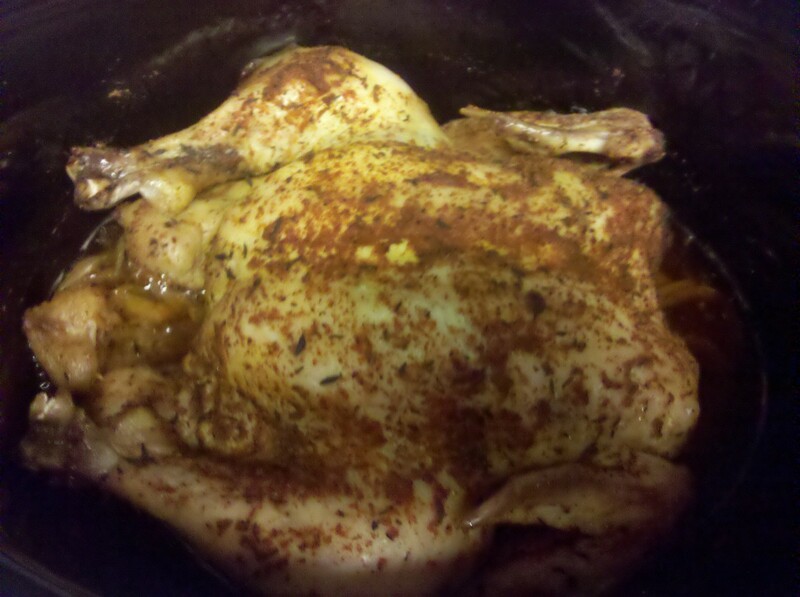 I hope you have found an easy and delicious chicken recipe for your crockpot or slow cooker. If you have any questions or comments about this recipe, feel free to leave these in the comment section below. You also have the option of giving a rating for this recipe up above. Hope your family enjoys dinner! This one is so easy to make! Hope you enjoy it! Appreciate you stopping by! This is just what I need and will bookmark this recipe and can't wait to try it. At my local grocery stores you never know how fresh the chicken really is but I can make this for my salads during the week and I also love to eat cooked chicken by itself! Voted up and across. Happy to hear you will be trying this recipe out RTalloni! Hope you enjoy it as much as my family does :) Thanks for stopping by and commenting! Thanks for posting your easy rotisserie chicken in a Crockpot. I'm looking forward to using this soon--thanks! Awesome! I am so happy you all enjoyed the chicken! It is so delicious. I need to grab a chicken the next time I am at the store so I can make it again. Thanks so much for stopping by and letting me know you tried it out! I made this for dinner tonight. Holy Moly it was *awesome*! I cut it up for us to add to salads and it was out of this world. My daughter kept coming over when I was cutting it up and stealing little pieces of chicken. 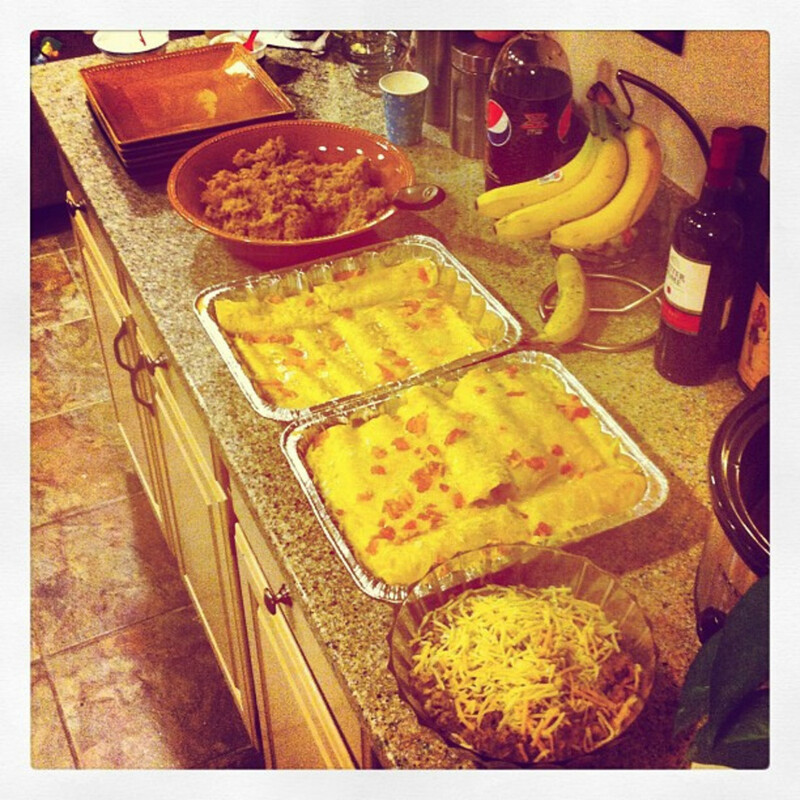 We will definitely be making this again! Hi vespawoolf! With my two boys, it seems like we have some kind of beans and potatoes with every meal. I hope it turns out well for you if you decide to try it out! Appreciate you stopping by and commenting! 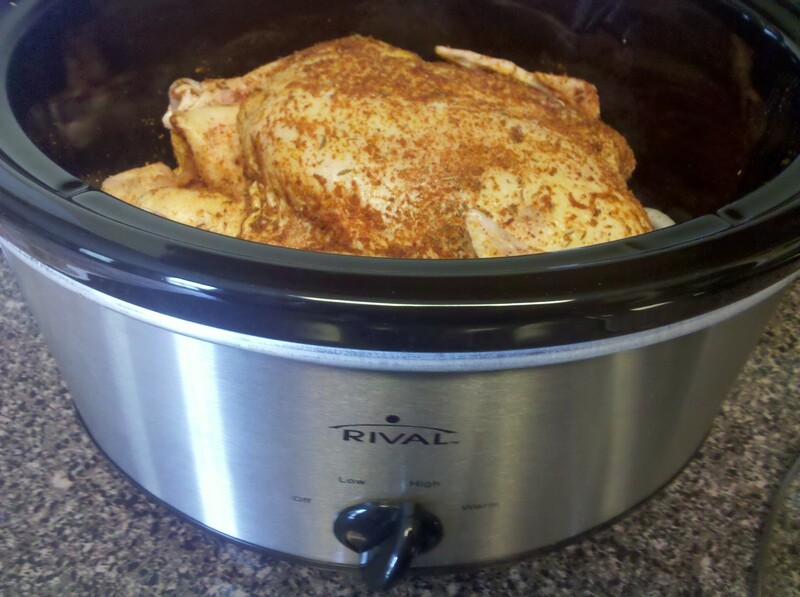 I had no idea you could make a rotisserie chicken in the crock pot! I love the idea of serving it with baked beans and mashed potatoes. Using the bones for stock makes it economical, too. Thank you for sharing your recipe with us! I know it seems too good to be true! But it really is that easy! 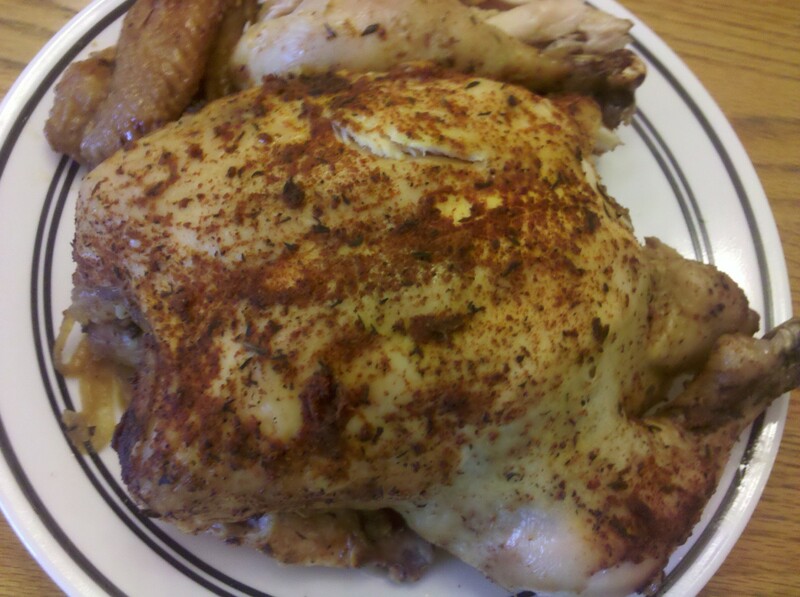 Kind of funny now that I was scared to cook a whole chicken and now I am wondering what other spice combos would make a good rub for my next bird :) Hope you enjoy it! Thanks for stopping by! Are you kidding me? How easy is this and it looks just like the ones in the stores! I'm sure that it tastes even better. I'm definitely putting this on my menu for next week. Thanks for the great recipe! Thanks so much Shesabutterfly! This is a great one to try out - hope you enjoy it! Appreciate you stopping by! Hi puter_dr! This is definitely one that you should try out - hope you enjoy it! Thanks for stopping by! Hi Teresa! It is definitely fall off the bone delicious. I am so happy I took a picture in the crockpot before I transferred to the plate. As you can see it didn't make it out in one beautiful piece :) Thanks so much for stopping by and for your kind comments! Great hub and easy to read directions. Will definitely be trying this recipe very soon. I love my crock pot and always looking for new delicious meals to create. Adding to my list of crockpot recipes. Thanks! Now I am hungry! I use a similar recipe for my home grown birds. The meat is fall off the bone delicious! Love the hub. The new recipe capsules look great! Hi randomcreative! This one is awesome. 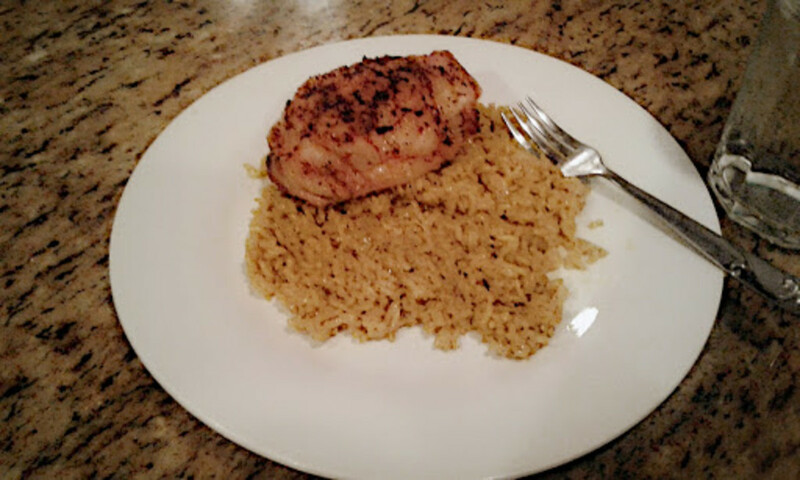 I have never tried to cook a whole chicken before but this recipe was super easy to make. Hope you enjoy it! Appreciate you stopping by! Great idea! Thanks for the awesome recipe. I am always on the hunt for new crock pot recipes. Thanks so much teaches12345! My crockpot has turned into my bestfriend lately. To be able to keep up with writing, cleaning, running errands, and taking care of kids, it comes in so handy just to throw some meat and spices in and let it cook all day for me - such a time saver! Appreciate you stopping by and for the vote up! Hi Kelley! It was really good and so easy to make. Hope you like it when you try it out! Thanks so much for stopping by and commenting! Hi Rebecca! Our house is a big fan of chicken too. I am all the time looking for new ways to make it so I can spice up the weekly menus. This one was a big hit with the family so I am definitely making it again soon. Appreciate you stopping by! I am so hungry for this recipe. We use our crockpot at least once a week and enjoy the ease and convenience of a one-pot meal. This is one we will use and devour in no time. The new look of the hub content is great -- good job of posting. Thanks for sharing. voted up. Yum!!! 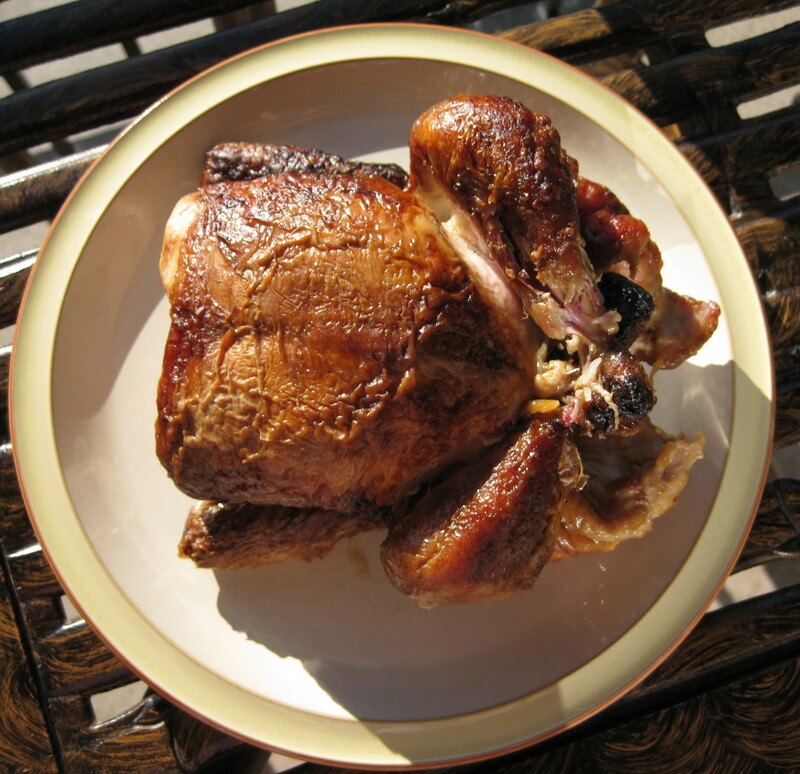 great idea for making rotisserie chicken in a crock-pot. I can't wait to try this soon! Great idea! I cook a lot of chicken. It's dirt cheap here where I live and I try to shy away from red meat. It looks yummy and thanks for the clear directions!